As ‘frack hits’ grew in Alberta, regulator (AER) takes action, but years too late; high pressure frac hits have been damaging hydrocarbon wells for at least a decade! The hiss of gas escaping was the first indication something was wrong in an oil field near the town of Drayton Valley, an hour as the crow flies from Edmonton, Alberta. A landowner whose cows graze there in springtime came across the well spewing oil and gas one evening in September 2011. The wind, blowing at about 2 miles per hour, fanned crude oil and chemicals onto the surrounding hay fields. The landowner telephoned Patrick Sheve, the field operator of Sword Energy Inc. (currently called Journey Energy Inc.), which partly owned the gas well. Sheve hurriedly cut off the power remotely and informed his bosses. A well owned by another company, Bonterra Energy Corp., had been hydraulically fracturing about 1,500 feet away. The process involves pumping water and chemicals into the ground to create a web of fractures in the shale. Trapped oil and gas rushes through the fractures, into the well bore and up the well. At times, fracking goes awry. The webs can connect with existing fractures in the shale and, in highly drilled areas such as the Cardium Shale of Alberta, create channels to nearby, older well bores. In such cases, known as “frack hits,” the pumped-in fracking fluid and sand flows underground, propelled by the immense pressures, and up the older well, causing a blowout and a spill. That’s what happened at Drayton Valley. Such cases were unusual in Alberta in 2011, and workers and regulators scrambled to figure out what could have gone wrong. 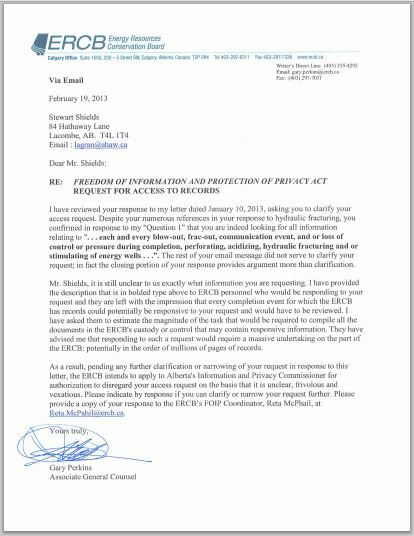 The events were disclosed to EnergyWire in response to a Freedom of Information Protocol request. Alberta regulators recorded more than 21 such incidents between 2010 and 2012 with at least seven resulting in spills of thousands of gallons of wastewater, fracking fluids and crude oil, according to documents. In other cases, though there were no spills, fracking fluid flooded well bores and the wells had to be shut down temporarily. Though regulators were cognizant of the danger, they took three years to put in place regulations to monitor and avoid frack hits. Regulations are yet to be implemented in the United States (EnergyWire, Aug. 5, 2013). In some cases, the same companies were affected multiple times by communication accidents. Bonterra Energy’s operations affected the Sword well and, the next year, a well owned by Sinopec Daylight. Bonterra was in turn fracked by operations by Vermilion Energy Inc. Other companies affected included Exxon Mobil Corp., Talisman Energy Inc. and Cenovus Energy Inc. In the early days, without protocols in place to monitor older and abandoned wells before fracking, companies scrambled to respond to unexpected spills and incidents. At Drayton Valley, Sheve had a roadblock in place by 9:15 p.m. in case the well exploded. Workers monitored the air for levels of explosive material. Sheve informed seven homeowners who lived nearby of the potential danger, and one moved to a Ramada Inn for the night. Sheve’s boss called up their counterparts at Bonterra to inform them of the leak since their well was nearby. Suspecting its fracking might be the cause, Bonterra immediately suspended its operations. Bonterra Energy had fracked its well at pressures of 3,000 pounds per square inch and had expected its fracking zone to reach 1,150 feet. The fractures had traveled farther to hit the Sword well, where pressures maxed out at 22 times the amount it was designed to withstand. The Sword well was safely shut off at 2 a.m. By then, some 2,000 gallons of oil and fracking fluid had spilled. Sword estimated it could cost as much as half a million dollars to repair its well. The landowners were calm about the incident, wrote G. Boyer, manager of technical services at Sword Energy. Sword offered to put up an electric fence to ensure the cows stayed off the oil-stained land while grazing. Bonterra Energy was not as lucky as Sword Energy the previous year. On Aug. 28, 2010, Bonterra’s well got flooded with fracking fluid due to a frack hit from a well run by Vermilion Energy. Bonterra contacted Vermilion and requested that the company suspend fracking until the well could be secured. Vermilion refused, according to a letter Bonterra submitted to the Alberta Energy Regulator. The well continued to be flooded for two days. The AER (previously the Energy Resources Conservation Board) realized downhole communication could be a problem years ago. In May 2010, the province of British Columbia issued a safety warning that it had recorded 18 frack hits. Then in December 2010, a Calgary-based company, Bellatrix Exploration Ltd., told Alberta regulators that one of its wells had suffered a kick. The company was fracking at the time, and the fracking fluid had traveled across the ground and into another well about 1,500 feet away. The AER investigated the Bellatrix communication incident six months later and found that fractures at the site had traveled much farther than the expected 492 feet. “I think the key finding is the frac propagated over 3 times more than would be expected for a frac of this size (pressure, fluid volume, duration),” wrote Al Smandych, senior technical adviser at the AER, in an email to his colleagues in July 2011. “These events [in northeast British Columbia and Alberta] have resulted in some serious safety issues (kicks, wellhead damage) and damaged wellbores,” he wrote. 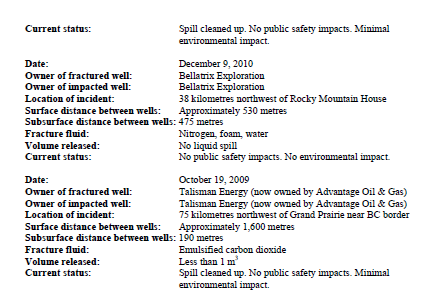 The agency also issued letters to other operators asking if they had experienced frack hits, but the AER did not take formal action until a large spill a year later [made public with photos from the Alberta Surface Rights Group; none of the previous cases were reported in the media. Frac hits have been a problem for at least a decade in Alberta with the AER, previously ERCB/EUB keeping them quiet]. On Jan. 13, 2012, about 20,000 gallons of oil and fracking fluid sprayed out from a well being produced by Midland Energy near Innisfail, a two-hour drive from Edmonton. The well was 420 feet [1.2 kilometres surface distance] away from another well being fracked. The geyser coated nearby trees and land in a thin coat of oil, according to reports at the time. Producing wells are generally thought to be stable, which led residents to the question why such an old well would start leaking. 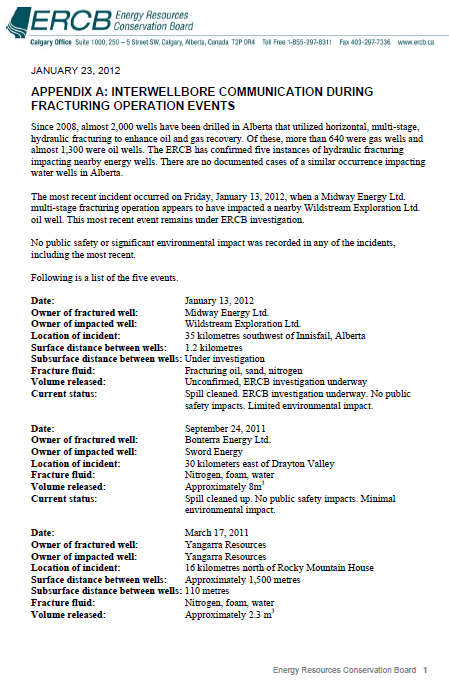 On Jan. 23, 2012, Alberta regulators issued a bulletin to all operators asking to be informed if they had experienced downhole communication. They also asked operators to monitor nearby wells before fracking and to inform the operators of those wells. It was the first public acknowledgement of the problem. As responses came in from operators, it became clear frack hits were not isolated incidents in Alberta. One of the responders to Alberta’s request for information was Equal Energy, which had drilled into the Cardium formation that’s 4,000 feet below ground. On March 28, 2012, Equal’s well bore was damaged by fracking at a nearby well owned by NAL Energy. There was no surface spill, but Equal’s well could not be repaired. The two operators decided to put together a protocol that would minimize damage in the future. They decided that operators would inform their colleagues who own wells within 1,500 feet of their operations about 10 days before fracking. They would also monitor pressures at nearby wells to figure out whether the wells are communicating. And as far as possible, they would shut in all producing wells on the day of the fracking. If the wells were old with inferior cement jobs, shutting in a well could increase pressure so much so that, like a thin-walled balloon bursting from too much air, the cement could rupture and leak fluids into surrounding ground. So the operators decided they would keep older wells flowing but rig an open-top tank to catch any fluids that get pushed out. Other operators set up their own protocols. Bellatrix Exploration, whose frack connected with an older well 1,550 feet away, decided it would inform operators with wells within 1,300 feet of its site and either temporarily shut down or monitor pressures at wells within 300 feet of its fracking operations. On May 21, 2013, Alberta eventually set limits to protect groundwater resources from frack hits. It said that operators can only frack a horizontal distance of 650 feet [198.12 metres] or more from any water well. It also required operators to model their fracks and assess the risk at nearby wells and to maintain well control plans in case there is communication and a spill. 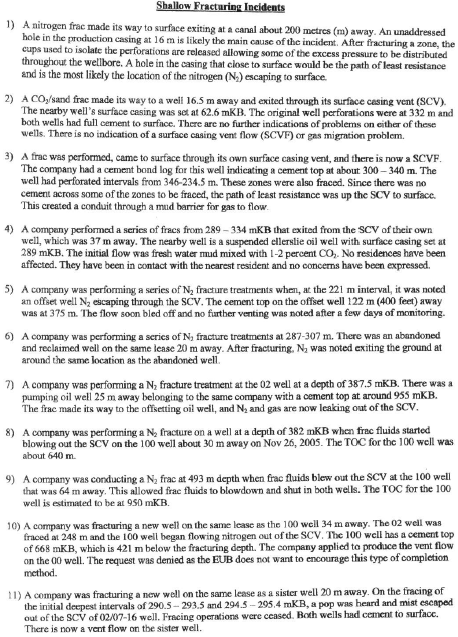 Such protocols were not in place at the Sword Energy well in Drayton Valley. Bonterra did not inform Sword it would be fracking ahead of time, and Sword was not prepared for the incident. Had a landowner not noticed the roar of gas escaping, the spill could have been larger. 2012: Hydraulic fractures: How far can they go? July 29, 2013: Will Fracking Become the Next Mass Tort?